Daled Amos: Still Unanswered: Is Egypt's Abdel-Fattah al-Sisi Just Another Islamist? Still Unanswered: Is Egypt's Abdel-Fattah al-Sisi Just Another Islamist? Who is Egypt's Mysterious New Pharaoh? 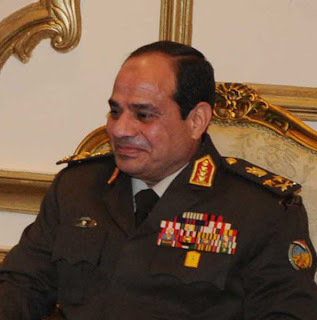 General Abdel-Fattah al-Sisi -- just another Islamistst? Mahfouz, despite a very strict Islamic upbringing, was from his youth a pharaonist—someone who placed Egypt's unique national heritage above anything else, including Islam, in defining her identity—as well as his own. One of Mahfouz's most prescient works is his peculiar 1983 novel-in-dialogue,Before the Throne. In it he hauls about three score of the nation's rulers--from Menes in the First Dynasty to al-Sadat—before the Osiris Court, the divine tribunal which in ancient Egyptian belief judged the souls of the dead. Before the Throne features many cycles of tyranny, rebellion, chaos and restoration, which presage the events of the past three years in uncanny ways. Technorati Tag: Abdel-Fattah al-Sisi and Egypt.